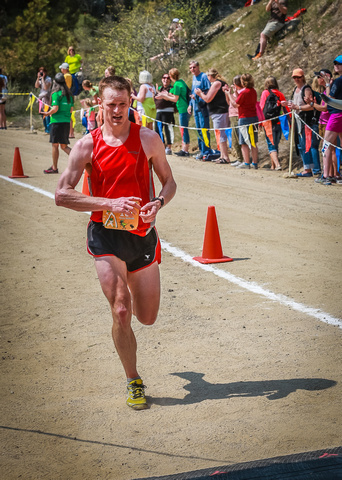 This was my sixth consecutive year running the Race to Robie Creek. I was very excited coming into this race. Last fall I injured a tendon in my foot, and I wasn’t able to train for a couple months. By January I was fully recovered and had three and a half solid months of training going into Robie. Besides that, I really liked this year’s theme: Gora! The Running of the Toads. I was looking forward to a great race. For those that aren’t familiar with the running scene in the Treasure Valley, the Race to Robie Creek is a rite of passage for runners in the Boise area. This year (2015) was the 38th Annual Race to Robie Creek that has been put on by the Rocky Canyon Sailtoads, a local running group. It’s run by about 2300 people every year, which makes it one of Boise’s biggest races. It’s covered pretty thoroughly by the local media outlets and is always front page news the Sunday after the race. Besides that, Robie Creek is a unique race embedded with tradition. Race registration takes place at “high noon” on Presidents’ Day. The race starts at “high noon” on the third Saturday of April. There is always a different theme for the race and usually some skit or artsy presentation 10 minutes before the start when everyone is lined up. This year’s theme was Gora! The Running of the Toads. Boise has the largest Basque population outside of Spain, which drove the theme. It was fun to see a few people dressed up in white with red scarfs and sashes. I’ve been training for the Newport Marathon in late May, so the Race to Robie Creek fell nicely into my training regimen. I debated how seriously I should run the race. I obviously wanted a good time, but I was unsure whether I should taper or just treat it as a typical long Saturday run. Fortunately, I had embedded a couple extra weeks into my 16 week marathon training schedule, so after some internal debate I decided to use one of my extra weeks to do a taper the week previous to Robie. My training was going well enough that was confident I could beat my previous best Robie time from last year (1:40:17, 2014), but I wasn’t quite sure by how much. I had worked in some hills to my long runs during my marathon training and I was hoping they would pay dividends. For my taper, I did an 8 mile run eight days before the Race to Robie Creek on a Friday. Micron, my employer, was putting on the Fab-ulous 5k the Saturday before Robie, so I ran that as well. It had around 150-200 people I think, and it amazed me what a little competition can do for my race time. I was able to run about 18:48 at the 5k since I had some people to run against. I had no idea I could maintain a 6 minute pace for three miles, and this was a big confidence booster going into Robie. I hadn’t run a 5k in two years, and it had been since early November that I had done any competition. To finish my taper, I did a couple 400m intervals during a six mile treadmill run on Monday, then cross trained on Tuesday (stationary bike and rowing), then did a 5.5 mile run on Thursday with 3 miles at 7min/mile pace. By Friday night I was anxious and excited. 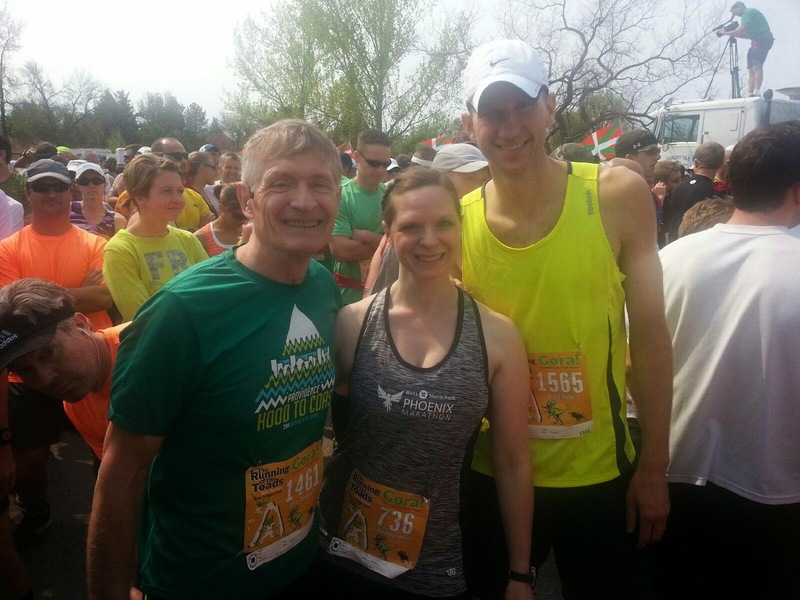 My father-in-law, Jerry, and sister-in-law, Kara, arrived in town to run the race as well, along with my mother-in-law and Kara’s daughter. Jerry and Kara ran with me last year (2014) and had a good time; however, Kara had a rough day as she puked a couple miles into the race for some reason. She really wanted revenge on the hill and wanted to have a better run this year. We were sure to get to bed relatively early. Since it’s a noon race, it’s tough to properly fuel for Robie Creek. I ended up eating some cereal in the morning, then lightly snacking until about 10am, at which point I ate a small PBH sandwich. We left the house around 10:30 and arrived at the starting area after 11am. We sat on the grass and walked around a bit and got ready to go. I had been worried about the wind as the forecast called for 20mph winds on Saturday. Fortunately the wind hadn’t picked up enough to be bothersome. I hardly noticed it going up the hill. I learned that if you don’t want to start slow you need to be towards the front of the pack, so I lined up just a couple people back from the starting line. Besides that, I knew that if I hit my primary goal of 1:35:00 I would be in the top 30 or so finishers. After a welcome by the race director and some words from Boise Mayor Dave Bieter, who is Basque, there was a Basque dance on the stage to the left of the lined-up runners. After the dance, the mayor yelled “Gora! Gora!” which took the place of the gun to send the race off. The Race to Robie Creek starts in a parking lot at Fort Boise and continues onto a road which loops around some softball fields. By the time we were a half mile into the run, I was surprised at how many people were in front of me. I was glancing at my Garmin and purposefully slowing my pace. There is so much build up and adrenaline going into a race that it’s hard not to get caught up in the moment. Knowing I’d be at a top-30 race pace, I was surprised to see about 200 people ahead of me. Once we hit the beginning of the “little” hill at Mile 1, I began passing people and continued to do so until about Mile 8. Before the Dirt: The first 3.4 miles consist of a flat mile 1, then a second mile up a decent hill, then a small downhill followed by some rising, rolling hills to mile 3.4. I planned on running this section at about a 6:50-7:00 pace. The Hill: Starting at Mile 3.4 is a dirt road and a hill. The 1700 foot, 6.5% grade hill is exactly 5 miles long and only has a couple short flat spots. Sometimes I break it up into 4 hills in my mind as there are 4 really steep parts, but it’s really one huge hill and it gives The Race to Robie Creek most of its stigma. The last ~0.8 mile of the hill is crazy steep and most racers walk some of it. I planned to run at about 8:20/mile on this part, but I knew this would make or break my time. The Downhill: Starting at ~Mile 8.4, there’s a crazy downhill to the finish line — about 1700 feet, which is a 7% average grade (I think). The first couple miles are really steep. Then it seems to flatten out somewhat, but it’s still knee-pounding downhill all the way to the finish. I wanted to do this section at 6:20 pace. Despite my attempts to calm down, my first mile came in at 6:16. I knew it would be fast so I wasn’t too worried. I felt good and made my way up the “little” hill. There are groups of spectators all along this paved part of Shaw Mountain Rd which winds through a ritzy subdivision. It makes for an exciting time. Right at the top of the hill at about Mile 2 there is the first aid station and a large crowd as it’s a nice place for spectators. After this crowd, the spectating subsides. I was feeling good at the top of the hill and the runners were beginning to thin out. I chatted a bit with a guy on my way down. I could tell that I was going to beat my target pace for the first section and I was fine with that. I was feeling pretty good still. I hit the second section at about a 6:40/mile pace, which I was happy with. This is where the race really begins and I knew that my pace on the hill would be crucial. I felt that in my 2014 race I had not attacked the hill hard enough, so I didn’t want to make that mistake again. I worked hard on the uphills and didn’t let up too much on the flattish parts. People tend to get quiet on the hill, especially the last mile death-march. I tried to smile and wave to a few groups of spectators and gave a fist-pump to the little band that is always present on the hillside around Mile 4.5. I was using Clif Shot Bloks for my primary nutrition and grabbing water at the stations. I try to down a Blok every couple miles or so. The hill went well. I ended up around 8:20/mile on average. Part of me was hoping I could pull of 8:00/mile which would have left me in striking distance of a 1:35:00, but when I got to the top I still knew I was well on my way for a PR. At about Mile 8 I passed the Temptation Station, which is always entertaining and a welcome distraction during that final climb. I didn’t consume any donuts or whatever else they had there. My pace slowed to over 11:00/mile on parts of the last section, but I didn’t walk and kept driving up. About a quarter-mile before the top I passed the lead female runner. I gave her a word of encouragement and kept going. Truthfully I was pretty happy to pass her and I hoped I’d beat all the women for the first time. I know that’s not politically correct to write. Reaching the summit of the Race to Robie Creek is such a relief. There’s a small crowd and some cow bells making noise. You step on the timing pad at the peak and grab a water, then the ankle-breaking downhill commences. I’ve generally been weak on the downhill, getting passed by multiple racers and losing energy. This year I was much more ready for it as I had done a couple 20 mile runs during my training as well as some intervals to help with my turnover. I focused on getting back as much time as possible out of the downhill. It went well for the first couple miles, then my abs started to lock up. This happened to me last year and I wasn’t excited to be cramping up again. I think that the pounding makes me tighten up my stomach too much. Fortunately the cramping only lasted about a half mile, but it got in my mind and slowed me down. Up to the cramping I thought I may have a chance at breaking 1:30:00, but the cramping pretty much extinguished those prospects. I exchanged positions with a couple other runners a few times; I can’t remember if my net position improved or worsened on the downhill. I felt that was good since usually I am passed by several people going down. Just when I was thinking I had bested the top female runner, she passed me at Mile 12. I was starting to weaken and my pace had suddenly slowed unconsciously. Right then she blew by me and said something like, “C’mon you can do better than that!” I didn’t know she was the one behind me. I sped up and tried to hold on. I was able to maintain a better pace, but I couldn’t keep up with her. She had a strong finish and a well-deserved 1st place. That final Robie mile always seems long. 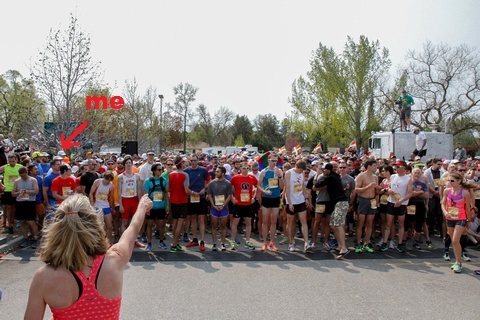 I always expect spectators to be closer to Mile 12. As it happens, very few spectators venture 100 yards in front of the finish line, and the windy dirt road seems to go on indefinitely. Finally I saw the finish and finished strong. Seeing my time of 1:31:10 was a sight to behold for me. It beat my PR from last year by over nine minutes and I couldn’t have been happier with how the race went. Later on I saw that I had placed 18th, which I never imagined I could do. After crossing the finish line I made my way to the bag pickup. I saw my high school teammate Kenny McDaniel sitting down and taking his shoes off. “Hey Kenny! How did it go?” I asked. I knew he would be in the top few runners as he has worked hard ever since we graduated together from Meridian High. “Well, I won,” he stated matter-of-factly. I congratulated him and he gave me a few more details. I have to say that it was well-deserved for him, and it’s inspirational to me that my old teammate pulled it off. It is a testament of his hard work and dedication over the years. I got to see a few friends and coworkers come through the finish area. It was fun to talk to them and most of them ran their best time. Jerry and Kara had solid races and felt way better than last year. The Race to Robie Creek always has great food and plenty of refreshments — everything from chocolate milk (for me) to beer (for others). We grabbed some food and gatorade and took the long bus ride home. Three years ago I finished in 2:08:28 at the Race to Robie Creek in 414th place. I recall at Mile 11 being absolutely miserable and committing to never running a marathon again, with doubts about running another half. I never thought I’d be able to place in the top 100 runners. Fast forward three years and it was a completely different experience. I recovered quickly and felt great afterwards. I immediately looked forward to running it again next year. The difference has been that I’ve persistently exercised throughout the year. I’ve worked harder and not taken months off like I used to. I have a supportive wife who gives the kids breakfast while I take off for a couple hours every Saturday morning. I’ve also been blessed to be injury-free for the past few months. I hope I can remain healthy and improve again in the future. If things work out, I’ll be running Boston rather than Robie next year, but I’ll be looking forward to 2017 for several months to come! Next Next post: Minor Injury?